The passenger compartment remained stable in the frontal test. The driver's footwell was deformed but it did not rupture and retained its stability. Nevertheless, pedal displacements were high and that of the clutch incurred a penalty. Structures in the dashboard posed a hazard to the knees and femurs of the driver and passenger. In the side pole test, chest protection was poor, with rib deflections exceeding safe limits. However, protection of other body regions was good in both the side barrier and the pole tests. Protection against whiplash injury in rear impacts was rated as marginal. In the frontal test, forward head movement of the 3 year infant, sat in a forward-facing seat, was not excessive and both dummies' heads were contained by the restraints in the side impact. The passenger airbag can be disabled to allow a rearward-facing restraint to be used in that seating position. However, insufficient information is presented to the driver regarding the status of the airbag. The bumper scored maximum points for the protection it offered to pedestrians' legs. The bonnet offered good protection in most areas where an adult's head might strike but was predominantly poor for protecting the heads of children. 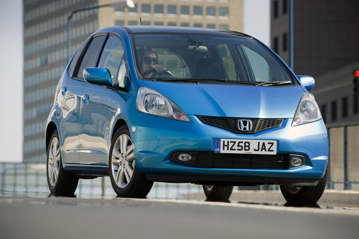 Honda is increasing the fitment of its electronic stability control (ESC) system during the course of 2009. Currently, ESC is fitted as an option to some variants in some countries, although the great majority of sales are expected to have ESC fitted as standard. Fitment will be increased until, by January 2010, ESC is standard equipment on all variants in all European countries. A seatbelt reminder system for the front and rear seats is standard equipment.